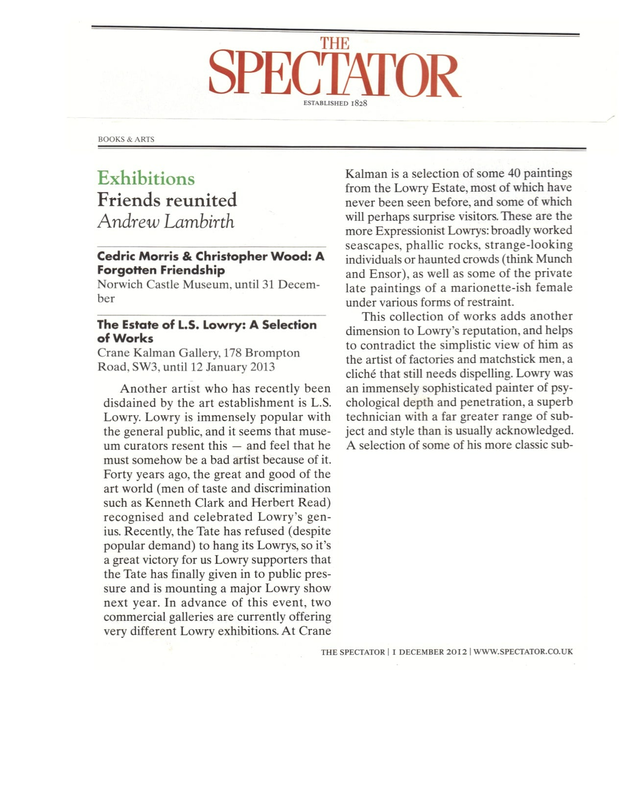 Another artist who has recently been disdained by the art establishment is L.S. Lowry. Lowry is immensely popular with the general public, and it seems that museum curators resent this and feel that he must somehow be a bad artist because of it. Forty years ago, the great and good of the art world (men of taste and discrimination such as Kenneth Clark and Herbert Read) recognised and celebrated Lowry's genius. Recently, the Tate has refused (despite popular demand) to hang its Lowrys, so it's a great victory for us Lowry supporters that the Tate has finally given in to public pressure and is mounting a major Lowry show next year. 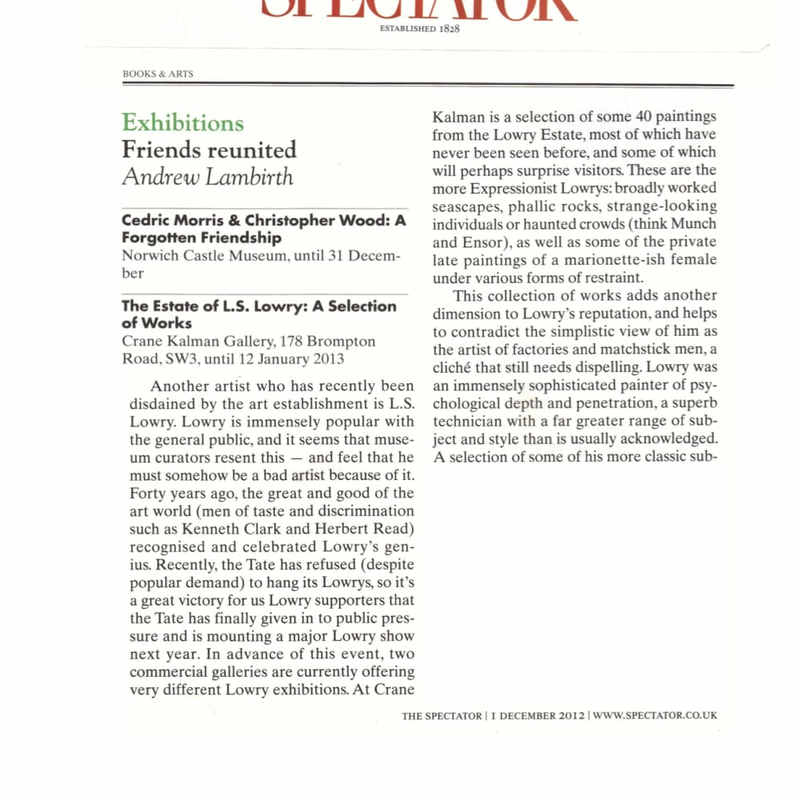 In advance of this event, two commercial galleries are currently offering very different Lowry exhibitions. At Crane Kalman is a selection of some 40 paintings from the Lowry Estate, most of which have never been seen before, and some of which will perhaps surprise visitors. These are the more Expressionist Lowrys: broadly worked seascapes, phallic rocks, strange-looking individuals or haunted crowds (think Munch and Ensor), as well as some of the private late paintings of a marionette-ish female under various forms of restraint. This collection of works adds another dimension to Lowry's reputation, and helps to contradict the simplistic view of him as the artist of factories and matchstick men, a cliche that still needs dispelling. Lowry was an immensely sophisticated painter of psychological depth and penetration, a superb technician with a far greater range of subject and style than is usually acknowledged. A selection of some of his more classic subjects can be seen at MacConnal-Mason Gallery (14 & 17 Duke Street, St James's, SW1, until 11 December), a fine group of street scenes, industrial landscapes and seaside views. 'The Steps' is pure street theatre in a crisply executed setting, 'Derbyshire' is a charming oil study for the larger landscape of the same subject, and 'Council Estate' is an extraordinarily radical composition (note how Lowry used the shapes of steeple and terrace-ends) comparable to C.R.W. Nevinson's great 'Road from Arras to Bapaume'. It's time to rethink preconceptions.